אלו דברים שאדם יוצא בהן ידי חובתו בפסח–בחיטים, ובשעורים, ובכוסמין ובשיבולת שועל, ובשיפון. I have left the translations of the five species of grain without their scientific terms on purpose, because they are heavily debated. For all opinions through out the ages and geographical regions and a very detailed scientific analysis see זהר עמר, חמשת מני דגן: מסורות הזיהוי, היבטים היסטוריים, הלכתיים ורעיוניים וענייני המקדש, מכון הר ברכה, תשע”א (Zohar Amar, Five Types of Grain: Historical, Halachic, and Conceptual Aspects, Machon Har Beracha, 2011. In Hebrew.) We do not actually know for sure if oats grew in the Land of Israel during the time of the Mishna and Talmud (1st – 5th centuries CE). However, the common accepted translations are as I have written them and are acceptable according to strict orthodox rules to fulfill the obligation of eating Matzah during Passover Seder. Out of these five grains, only oats is Gluten-Free. I have created this recipe, based on the original Exodus Biblical Matzah recipe, for those people who cannot eat gluten due to sensitivity, allergy, or Celiac Disease, as I personally know how it feels, since I have two such individuals in my family, my wife and one of my sons. Gluten-Free Oat Passover Seder Matzah is made with Gluten-Free 100% Oat Flour and water only. It is Kosher for Passover according to strict rules of Kashrut and can be used to fulfill the commandment of eating Matzah during the Passover Seder. This recipe was created specifically for people who cannot eat gluten. Set aside a pitcher of room temperature water. The temperature of the water should be 68 - 77 degrees F (20-25 degrees C). The traditional method of getting the water to be the correct temperature is to put the water into a pitcher and let it sit in the room away from direct sunlight for at least 12 hours (usually over night) until the temperature reaches equilibrium. However, for the sake of saving time you can simply mix warm and cold water and measure the temperature with a thermometer until the correct temperature is reached. Place a ceramic pizza stone on the top shelf of the oven, which is right below the top heating element. Turn the oven to broil so that the upper heating element is on. If your oven does not have an upper heating element use the broiler. The Matzah must bake right next to the heating element or it will not fully bake quickly. Do not use the oven fans. Preheat a ceramic pizza stone in the oven for at least 1 hour at 500 degrees F (260 degrees C). Do not start mixing the ingredients until the pizza stone is complete heated through. Keep the oven on at 500 degrees F (260 degrees C), before mixing the ingredients with the hot pizza stone inside the oven. Place 1 3/4 cups of the Gluten-Free Oat flour into a large stainless steel bowl in which the dough will be kneaded. Set the timer for 18 minutes. This is the maximum allowable time that can pass between the mixing of the flour and water and all of the dough being fully baked, in order for the Matzah to be Kosher for Passover according to strict rules of Kashrut. Slowly add 1/2 cup of water to the flour in the bowl. Quickly knead the dough with your hands by folding it over and over. The dough will form into a nice firm ball after 2-3 minutes of kneading. Sprinkle a large wooden cutting board, which will be your rolling surface, with some flour to prevent sticking. Take the ball of dough from the bowl, place it onto the rolling surface and roll it with your hands into an even cylinder slightly shorter than the width of the cutting board. Cut the dough cylinder into 3 even pieces. Set 2 of the pieces aside on the cutting board and with your hands roll the remaining piece into a small ball. Take a wooden French rolling pin, rub some flour onto it with your hand, and begin rolling out the dough ball into a flat pancake. Keep rolling the dough into different directions so that the pancake comes out to be round. The final thickness of the pancake should be about 2-3 mm (0.08 - 0.12 in). This step should take no longer than 1 minute. If you would like a perfectly round shaped Matzah, after it has been fully rolled out, you may want to press a round 6 in (15 cm) or 8 in (20 cm) cookie cutter into the dough and remove the remainder of the dough around the cutter. Place the rolled out pancake onto a wooden pizza peel. Repeat steps 10-12 with 2 more pieces of dough that you set aside, until you have 3 dough pancakes placed on to the pizza peel, which should make it full. Insert the pizza peel into the oven and carefully shake off the 3 pancakes onto the pizza stone. You might want to slide out the shelf with the pizza stone from the oven so it is easier to place the pancakes on it without getting burnt. Close the oven door and stay next to the oven. Do not walk away. After 1 minute open the oven door and check if the Matzah started to become slightly brown and bubbles started forming on top of the dough. Once that happens flip all 3 Matzot onto the other side. Check the Matzah again after no more than 1 minute. Oat dough takes longer to bake than wheat dough. The Matzah will bake on the first side for approximately 4 minutes and on the second side for approximately 1.5 minutes. The total baking process should take no longer than 5-7 minutes. Take out the Matzot from the oven using the wooden pizza peel and place them on a plate or a wooden board to rest. The whole process must be competed in under 18 minutes in order to be compliant with strict laws of Kashrut. This is easily achievable if all steps are done efficiently. Enjoy. The Matzah should be firm with some crunch to it. Oat Matzah is not as flavorful as wheat Matzah and might resemble a slight texture of cardboard. Hey Buddy!, I found this information for you: "Gluten-Free Oat Passover Seder Matzah – מצה שיבולת שועל". 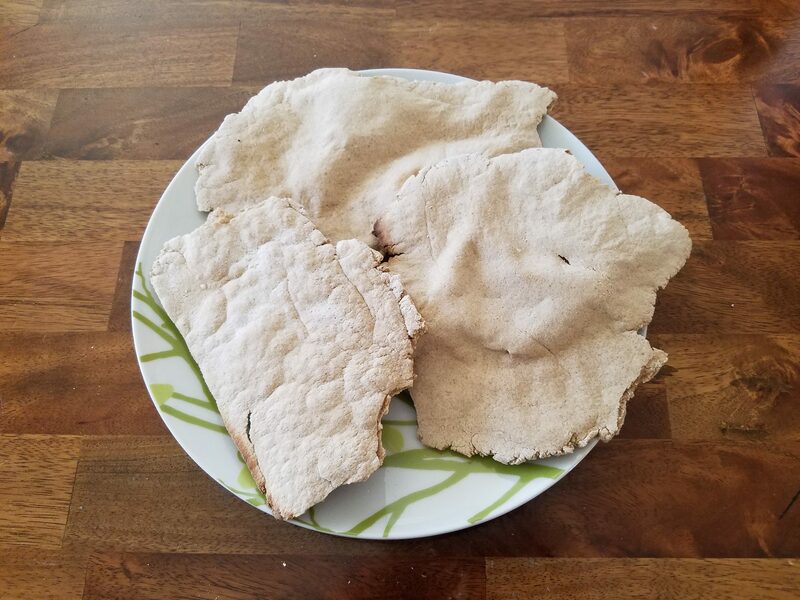 Here is the website link: http://www.ancientrecipes.org/recipes/gluten-free-oat-seder-matzah/. Thank you.